For the first time insight can be gained as to which countries profit the most from multilateral organizations like the United Nations, NATO and the World Bank. Surprising financial flows are now public and available for research. Almost 400.000 contracts that multilateral organizations procure with companies have been visualized by Hivos, Cordaid and Open State Foundation on OpenMultilaterals.org. 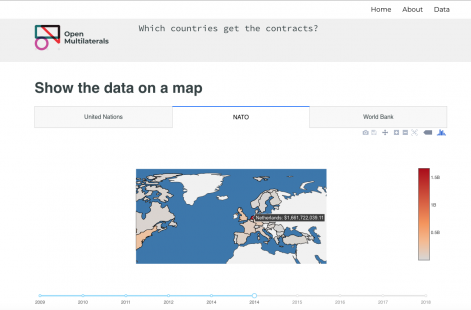 The contracts of the United Nations, World Bank and NATO are also available as open data. The Netherlands and other member-states pay billions to multilateral organizations. These organizations procure medicine, equipment and infrastructural projects from private companies. Until now these contracts were not very accessible and transparant. With the exception of the World Bank, the multilateral organizations hide these data in badly accessible pdf-files. To get more insight in the public funds that are spend by multilateral organizations, Open State Foundation freed these data from pdf-files. The information was bundled and visualized at OpenMultilaterals.org. On this website the date are shown on a world map and in graphs and tables. The raw data is available as open data for further analysis by journalists and researchers. What can you do with these data? From the data it is evident that Dutch companies earned half a billion euros in UN-contracts. Furthermore a loan for HIV-medicines in the Democratic Republic Congo stands out. The contract is funded by the World Bank and the medicines are supplied for by a Chinese company. The initiators are curious to find out which insights users can get from these data. Questions like how much a country benefits from multilateral contracts, how much contracts are won by certain companies and which financial flows stand out can now be answered. The coming months Hivos, Cordaid and Open State will add extra visualizations to the website. The initiators already note that multilateral organizations should publish more data. At the moment only the amount, the recipient and some basic information about the contract is provided. For optimal insight NATO, World Bank and the United Nations should release more information on the content of the contract, which companies and which kind of companies were in the running for a contract and finally where the companies come from.